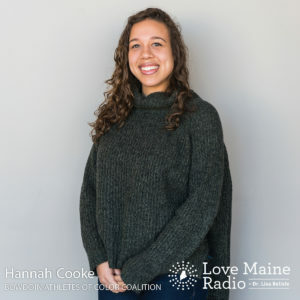 Bowdoin College student Hannah Cooke is the founder of the Bowdoin Athletes of Color Coalition, which brings together student-athletes of color to discuss their experiences of playing sports. Hannah was born and raised in Portland, and she is now a double major in Government and Legal Studies and African American Studies with a minor in Education. She participates in varsity squash, varsity basketball, and varsity track and field at Bowdoin College. She also works as a dialogue and conversation coordinator at Bowdoin College, investigating issues of diversity, and as a counselor, volunteer, and speaker at Seeds of Peace in Otisfield, Maine.